I’m headed to Dartmouth at the invitation of old friend Terry Tempest Williams, to show Profit and Loss and Islands of Sanctuary on Wednesday. Terry has hiked the area of eastern Utah where development of tar sands is looming, and she and many others in Utah are justifiably worried. Activists occupied the area and were arrested blockading road construction last summer and when Terry and I showed the Standing on Sacred Ground films in Salt Lake City last December many of the tar sands activists were in the audience. They’re now using Profit and Loss to raise awareness in Utah about the ecological and public health impacts of tar sands in Alberta. The Utah activists have important allies in Canada. With the electric rise of Idle No More, First Nations’ leadership has placed all of the many proposed tar sands pipeline projects in serious legal limbo. There is also fierce local opposition to the proposed Enbridge Northern Gateway pipeline to Kitimat, 400 miles north of Vancouver, which would require a new marine export terminal for more supertankers. Lest we forget about the east coast, TransCanada (in addition to Keystone XL) wants to build “Energy East” to the Atlantic coast at a cost of $10 billion, to carry 1.1 million barrels per day across 2,850 miles. Serge Simon, Grand Chief of the Mohawks of Kanesatake, near Montreal, says his community will use blockades to stop the project, which he’s certain will pollute land and water. “Blockades have been a very useful tool in the past, and despite the threat of being locked up for life, I don’t think that’s going to stop us,” he told Reuters. It’s not just protests and constraints on getting oil out of Alberta that threaten the industry. The low price of oil is killing new tar sands development. 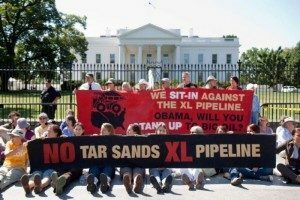 A study prepared for the U.S. State Department’s review of the Keystone XL pipeline estimated that tar sands projects become unprofitable at prices below $65-75 a barrel. Prices recently fell under $50 and have been hovering between $50-60 per barrel. The last decade’s rapid expansion in Alberta has all but stopped. In February, Occidental Petroleum curtailed its activities in Canada’s tar sands. Three large expansion projects were abandoned in the past year: Shell canceled the long-planned Pierre River Mine, which would have produced 200,000 barrel per day; Total, the French oil giant, canceled the proposed $11 billion Joslyn mine (160,000 barrels per day); and Statoil, the Norwegian oil company, shelved a major expansion project worth $1 billion. Were we to burn all of the recoverable tar sands oil in Alberta it would add 22 billion metric tons of carbon to the atmosphere. Scientists estimate this would cause an increase of 0.4 degrees C. in global temperature. Many thoughtful people are now calling for “stranded assets” to be the environmental and social justice movements’ first priority: the tar sands should be left in the ground. Some good news—and an important struggle you can help: The Beaver Lake Cree Nation is fighting an important court case challenging tar sands leases as treaty violations. You can help the Beaver Lake Cree by contributing to a new crowd-funding initiative to support their landmark case to protect traditional lands and constitutionally-guaranteed treaty rights to “hunt, fish, and trap in perpetuity.” Please donate today to support the Beaver Lake Cree! Next week (the third and final part of this blog): What are the Koch Brothers doing with two million acres of Alberta’s tar sands? P.S. Proof that great minds think alike, just after posting this blog, The Guardian published a piece by Crystal Lameman of the Beaver Lake Cree Nation, “Life Above Albert’s Tar Sands—Why We Are Taking the Government to Court.” Check it out!